Creamy Mutter Paneer (Creamy Peas and Paneer curry) | Authentic Vegetarian Recipes | Traditional Indian Food | Step-by-Step Recipes | Give Me Some Spice! I haven’t been sharing my recipes regularly for the past few months as one of my family member hasn’t been well and needs a lot of care. This has meant that a lot my cooking has had to be quick and simple – like this curry. Every time I pick up a store bought paneer I notice that they change suppliers and the quality of paneer changes too. The paneer I used for this recipe was firm like cheese so I didn’t marinade it. I lightly stir fried it in some oil and cooked it with very few spices. It worked well and tasted great. 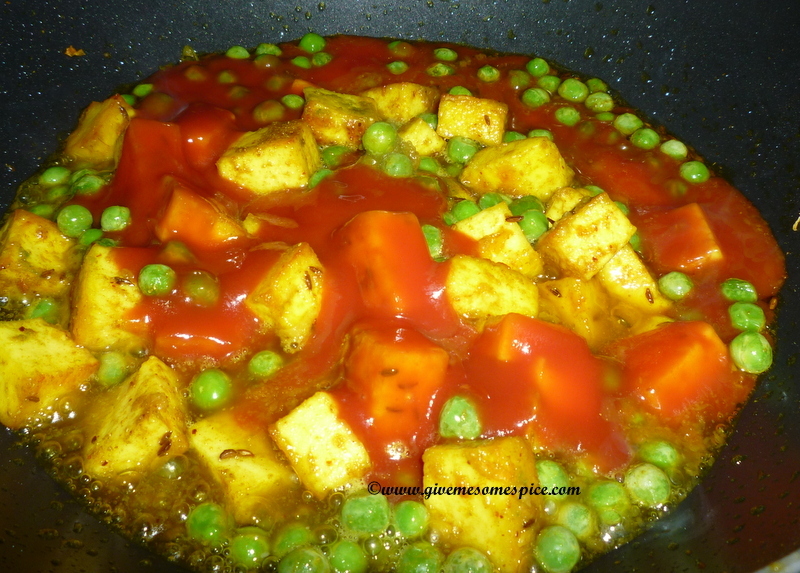 Cut the paneer into cubes. Heat the oil in a non stick pan and add the cumin seeds. Once the cumin seeds get dark. add the garlic and stir the oil. Add the garlic cubes to the oil with the garlic. Add the spices – salt. turmeric. chili powder. cumin and coriander powder. Stir the paneer so that all the spices coat the paneer. Cook this on medium heat for 5 minutes taking care that it doesn’t stick to the pan. 2. Add the peas and allow them to soften. 3. Add the tomatoes, jaggery and half a cup of water. Allow this to cook for 5 minutes. 4. Add the cream and stir and allow to cook for a further 5 minutes. 5. Your curry is ready to be served hot with rice . How do you cook your paneer?